That is right folks, you may have heard it on the grape-vine, and it is right! GoneAgain will be gone again for a few months. This time he will be test-cycling a Zoco Electric Bicycle across Asia for 5000kms (to begin with) to draw attention to his affliction; Cystic Fibrosis. And so Crow has offered his Oz Rock Inn to host a fabulous fund-raiser for the team! As always all retailers in town have gotten together to get absolutely fabulous prizes together for raffle and door prizes, and some mega big ticket items, including a Fully Automatic Bean Grinding, Froth Producing, Capuccino maker from Cebo which we may need to put in a Silent Raffle so that someone who wants it actually gets it! Did I hear you mumble alcohol? Well, we will be well catered for. The bestest brewer in the region has already donated a keg for us, and that keg will be sold at $2/glass. Wine will be flowing freely as well. For desert drinks we will have Jans, a lightly spiced dutch herbal liqueur dubbed the Friendship Drink. 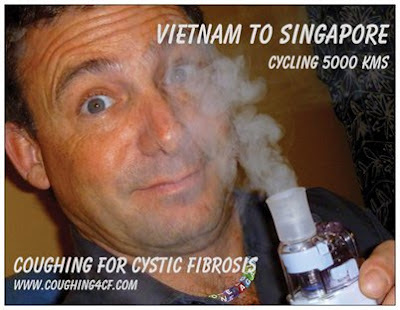 I am sure it is good for Cystic Fibrosis, and certainly will help prevent you from catching it. Special thanks to Rolf the Australian importer for organising this treat! PREPAY VIA INTERNET FOR CHEAPER ENTRY or BYO before 6 August! FRIDAY 27 JULY - 630PM DINNER at the Ulverstone OzRock Inn for dinner and some drinks and door prizes. Bring money for Raffle and extra drinks. Entertainment still to be decided (suggestions?). 50% Of proceeds to go to CF Tasmania! $55 entry at door, and much cheaper when you pre-pay before Tuesday 24 July through the link below! All payments non-refundable.